This method of reducing propeller guard drag invention disclosure was too long for our < 2011 Propeller Guard Technologies page so we posted it here. We will leave the invention below as it was originally posted (except for updating the code and spelling errors). Our later modifications and thoughts on the invention are posted in the Comments Section below the original posting. We claim the the propeller safety invention described below and now make a public disclosure and place all parts of it not previously patented by others in the public domain for use by all who wish to manufacture or use it. This invention may have been previously briefly mentioned by us in the past, but is described in more depth here. We are continuing to do this more formally because we have seen several concepts expounded here later patented by others. The world is certainly welcome to patent improvements to this invention but the basic concepts not previously patented by others are open for use by all. This information is posted as a public disclosure. It is NOT professional advice. Any use of this information in developing prototypes, models, test vessels, or real boats and or the operation or use of those prototypes, models, test vessels, or real boats is done at your own risk. We wrote this invention after reading the scientific literature. Our process has NOT been verified on an actual cage type propeller guard. To us, it looks like an area very worthy of further pursuit. That is why we are publishing it here. Now it is open to all who may wish to further develop it. This invention exploits the large reduction in drag that occurs when boundary layer flow of water across a circular cylinder transitions from laminar to turbulent. The phenomena allows use of larger diameter rods or other shapes (for increased strength and durability) in forming the cage AND/OR a tighter mesh (reduces the potential for contact with the propeller or entrapment) than previously possible without creating tremendous drag AND/OR higher boat velocities. Traditional cage type propeller guards range from a series of somewhat evenly spaced rods like sometimes seen in a catchers mask (like in the Prop Buddy guard) to a wire mesh (like the rear panel of the MariTech Swimguard propeller guard). Tradeoffs are involved in the design. The tighter the mesh (the more rods per foot and/or the larger their diameter) the lower the probability someone will come in contact with the propeller. However tighter meshes increase drag of the cage. In addition to drag, if the guard extends in front of the propeller, a tight mesh will restrict inlet flow to the propeller, and disturb the water which lowers the efficiency of the propeller (reduced speed at a given engine RPM) and may increase the possibility of cavitation. The same is true of rear panels when the drive is used in reverse. Designers seek a balance between the openness of the mesh (performance of the propeller and boat ) and level of protection obtained (performance of the guard) for life in the water and for the propeller itself. The larger the wire or rods used in construction of the guards, the more rugged and durable the guard. However, the larger the wire, the more drag the guard has, as well as the more disturbance that may be created in front of the propeller. Wire or rod diameter is another trade off balanced by the designer. Fluid mechanics students studying drag often begin by studying very basic shapes in cross flow, such as flow around a circular cylinder Imagine a pipe running straight across a river, submerged several feet below the surface of the water. The river flows across it. The drag force experienced by the pipe against the river can be modeled as a circular cylinder crossflow. Rods or wires of cage type propeller guards present a similar circular cylinder cross section to oncoming and/or exiting flows. When the mesh (distance between the rods/wires) is relatively open as in the case of most guards, most of the resistance can be modeled as a single very long wire in cross sectional flow (just add up the total length of wire exposed to cross sectional flow). The rods/wires result in drag just as if they were the long pipe going across the river described earlier. Note, some wires in front of the propeller may be exposed to slower flows than those directly behind the propeller. The boat tends to carry some water along with it which can make the actual inflow speed to the propeller slower than the boat speed. Plus the propeller will have higher exit velocities in some areas directly behind it. Laminar boundary flow (flow at lower speeds) tends to separate from the rods at about 90 degrees to the direction of flow (it hits the front of the rod, flows to either side around the front of the rod, but not around behind it). The laminar boundary flow just keeps going straight on and does not fill in behind the rod. If the boat is capable of going fast enough, boundary flow over the wires/rods eventually becomes turbulent and the flow actually separates from the rods a littler further around on the back side of the wire/rod. The change in location of separation has a significant impact on form drag (also sometimes called pressure drag). The further on the back side the flow stays close to the surface of the wire/rod, the lower the form drag. The form drag is lower because some pressure is exerted on the rod from behind in the area the fluid has not yet separated from the wire/rod. This helps balance against some of the pressure on the front of the wire/rod. The Reynolds Number, a non-dimensional measure of the ratio of inertial forces (velocity times density) to the viscous forces (dynamic viscosity divided by a characteristic length), is used to characterize different flow regimes (such as laminar or turbulent flow). For example, laminar boundary flow across cylinders of infinite length tend to go turbulent at Reynolds Numbers of about 250,000. Drag Coefficients have been experimentally determined for the form drag of cylinders in cross flow at various Reynolds Numbers. While the above statements may seem pretty technical, propeller guard drag is directly proportional to the drag coefficient. 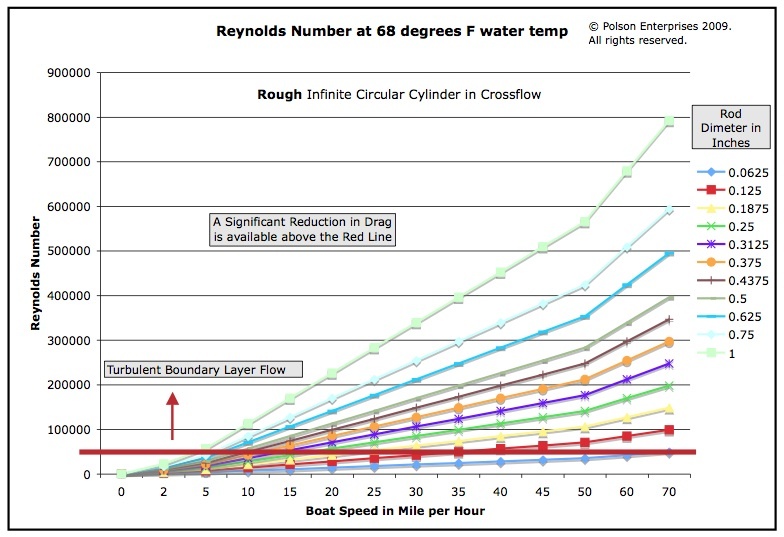 As seen in the chart below, drag coefficients are drastically reduced for the range of Reynolds Numbers near the right edge of chart. Those two facts combined establish the potential for tremendous reductions in propeller guard drag IF the guard is operated in the range of Range of Reynolds Numbers with the reduced drag coefficients at higher Reynolds Numbers (near the right edge of the chart). Chart above comes from Introduction to Fluid Mechanics. Second Edition. William S. Janna. PWS-KENT Publishing Company. Page 251. The left part of the image indicates the original source. Similar charts can be found in several fluid mechanics textbooks. The area of primary interest in the curve above is the strong dip in the curve near the right side between 10 to the fifth and 10 to the sixth. When flow turns turbulent there is a very significant dip in drag coefficient. Please note the drag coefficient axis is a log scale and shows the drag coefficient can fall from 50 to 75 percent. Use a combination of these options (such as make the rods a little larger, make the mesh a little smaller, and still have some increased boat speeds over the other designs. This approach only works if the boundary layer flow on propeller guard rod/wires turns turbulent in the range of operation of recreational boats. We verified this by creating a spreadsheet of rod/wire sizes and boat speeds. We used the spreadsheet to develop the accompanying Smooth Cylinder Reynolds Number Chart. It shows the higher Reynolds Numbers at which the drag reduction begins to take effect for smooth cylinders are generally at a bit higher speeds or larger diameters (rod sizes) than could be taken advantage of in many propeller guards (without taking any existing free stream turbulence or other possible effects into account). For example, a 40 mph boat would require something of the nature of 5/8 inch diameter rods on its propeller guard to get the Reynolds Number high enough to be operating in the region of reduced drag coefficients (not taking existing free stream turbulence into account). 5/8 inch diameter rods would create a considerable resistance from rest to 40 mph. Then, once well into the drag reduction region if they achieved a 50 percent drag reduction it would be as if the boat had 5/16 inch diameter rods (a more realistic diameter rod for this type of boat, but still too large to make a close mesh with). The greatest potential of this invention may lay in the ability to turn boundary layers turbulent at lower Reynolds Numbers (at lower boat velocities and/or at lower rod/wire diameters), thus taking advantage of the huge drop in drag coefficients at more typical boat speeds and more typical rod/wire diameters. Increasing free stream turbulence (already present due to water being disturbed by passage of the boat, the drive, the propeller, leading panels of the guard, etc). Rough surfaces on the rods/wires (which could be designed in somewhat like golf ball dimples). Optimally, this roughness can be concentrated just before the laminar separation area (where the flow is just about to go around behind the wires/rods). Some scale model propeller testing facilities attach carborundum to the leading edges to create roughness. Carborundum could be similarly used here on the rods/wires. The roughness could also be mechanically added to the wire/rod by stamping or other mechanical processes. Roughness can also be achieved by the use of grooves in the wire/rod. Use of tripping wires (wires attached to the out surface and parallel to the axis of the cylinder). Note these wires could actually be formed as part of the primary rod/wire. Bends in the wires/rods themselves. Changes in diameter or cross section shape in the wires/rods themselves. The rods/wires crossing each other in the mesh reduces the Reynolds Number required for turbulent flow. Reference: Vortex-Induced Vibrations of a Cylinder With Tripping Wires. F.S. Hover, H. Tvedt, and M.S. Triantafyllou. Journal of Fluid Mechanics. Vol. 448. Pgs. 175-195. (2001). Cambridge University Press. 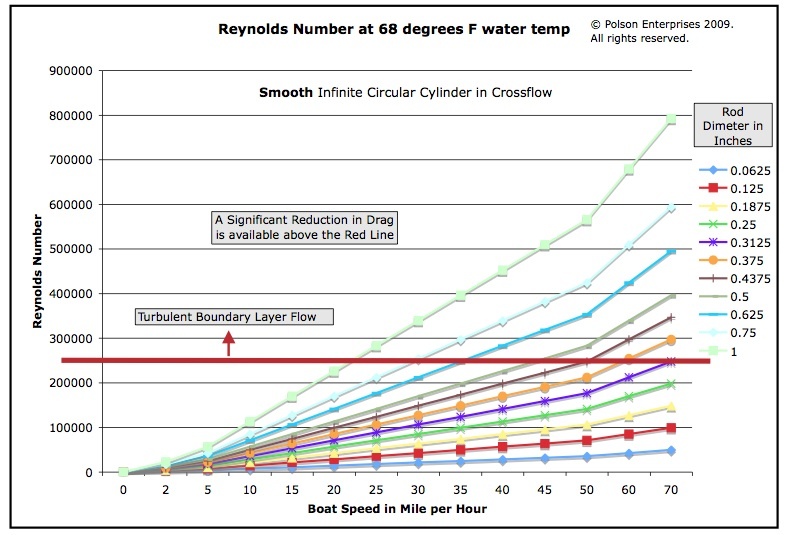 The above methods or others could be used to encourage boundary layer flow to go turbulent earlier and thus gain the drag reduction benefits at lower speeds and/or smaller rod/wire sizes than shown in the Smooth Cylinder Reynolds Number Chart above. Please note, the chart supplied above shows a rough cylinder reaching the bottom of the dip in the drag chart at a Reynolds Number of 100,000. This can be achieved rods/wires less than half the diameter of that required for achieving turbulent boundary flow with smooth cylinders. See our Rough Cylinder Reynolds Number Chart for inception of turbulent boundary layer flow for rough cylinders. As you can see, these diameters are more practical for many boating situations. Plus they create lower drag during laminar boundary flow (while the boat accelerates up to the turbulent boundary layer condition on the propeller guard rods/wires. Turbulent boundary flow at these or still lower Reynolds Numbers can be achieved by surface roughness and/or some of the other methods mentioned earlier. Now the same 40 mph boat discussed earlier can begin to enter the region of lower drag coefficients at Reynolds Numbers of 50,000 with a rod/wire diameter of 3/16 inch. This diameter is much more practical for achieving 40 mph to start with. Plus now if the boat can go fast enough to achieve a 50 percent reduction in drag coefficient, the rods/wires only create the equivalent drag of a 3/32 inch thick rod/wire operating in laminar boundary layer conditions. Using techniques to move the drag reduction curve to the left, allows a much wider range of boats to take advantage of this effect and lower the drag of their propeller guard OR increase rod/wire diameter size for durability and strength OR decrease mesh size for increased protection of people and other life forms OR a combination of the options just mentioned. Note – if some of the wires/rods or other surfaces run at an angle other than perpendicular to oncoming flow (such as bars that may run outward from a V near the leading edge of the drive to a ring around the propeller at the rear) length is calculated as their projected length to the plane perpendicular to the propeller. One obvious point is the velocity is squared. Velocity is a very dominant factor in any drag calculations. Some propeller guard manufacturers currently use rods/wires of elliptical or flattened shape (round wire smashed to elliptical, but flattened on two sides) to reduce drag as they provide increased durability and stiffness with a reduced frontal area. The same methods and techniques described in our invention to allow the use of larger diameter rods/wires at a reduced drag can be applied to these other shapes and to rods/wires of all shapes.Fluid Mechanics textbooks contain similar Drag Coefficient curves (Drag Coefficient vs. Reynolds Number) for a wide variety of shapes. Similar to cylindrical rods/wires, these shapes also exhibit significant drag reduction of higher Reynolds Numbers.Similar to round rods/wires, the Reynolds Number at which the Drag Coefficient begins its sharp downturn can be lowered by the same methods listed earlier (higher water temperatures, rough surfaces, tripping wires, vibration, increasing free stream turbulence, bends in the rods, the rods/wires crossing each other, etc.). Our invention applies not only to round rods/wires, but to all other cross sectional shapes as well, Including those formed by casting or molding one or more cross sectional shapes together to form a mesh. This invention uses the term “mesh” and/or “screen” to represent not only a physical barrier that presents relatively square openings, but also to physical barriers that present all other opening (rectangular, round, just horizontal rods, just vertical rods, sloped patterns, non uniform openings, etc.) As well as those combining various shapes or patterns of openings and those combining various thickness of rods/wires or other materials. Although this discussion and the related charts focus on fresh water, the same concepts hold for operation in salt water. The ratio of density to viscosity is lower for salt water than it is for fresh water. This leads to lower Reynolds numbers for guards operating in the same conditions. This means that for boats operating in salt water, the sharp reduction in drag will occur at a slightly higher boat speed than for the same boat operating in fresh water. This creates an opportunity to use some of the tools we listed earlier to encourage the onset of turbulent flow earlier (rough surfaces, tripping rods, vibration, bends in the rods, etc).This invention applies not only to fresh water operation, but to salt water operation as well. As mentioned above, the total drag of a the guard in a given boundary layer flow regime (laminar or turbulent) is fairly proportional to the square of boat velocity. This means the use of large rods/wires to bring the onset of turbulent boundary layer flow and its drag reduction benefits to the guard at lower boat velocities will have minimal impact on drag at non turbulent boat velocities (velocity makes its greatest contribution at higher speeds). The selection of larger rods/wires will have minimal impact on vessel drag at slower speeds. The ability to use larger diameter rods/wires allows the possible substitution of other materials in their manufacture, especially those materials that might not have been strong enough in the smaller diameters previously used. This may allow the substitution use of composites or plastics in some instances resulting in screens which could be molded, lighter, non-corrosive, more easily contoured, easily brightly colored to call attention to risk of the propeller, and provide other advantages as well. There is still bit of a tradeoff cage guard designers targeting the reduced drag zone at higher Reynolds Numbers must pay attention to. A drag penalty is paid for the increased frontal area of the larger diameter rods typically used to achieve these higher Reynolds Numbers. Or smaller diameter wires can be ran at very high boat speeds to achieve the higher Reynolds Numbers. For those who may wish to extend the calculations to add the effects of screens, we refer you to Pump Handbook. Igor J. Karassik, Joseph P. Messina, Paul Cooper and Charles C. Heald. 2007. Section 13.2 Intake Modeling. Page 13.45. While operation in this range provides great opportunities for drag reduction it comes as a result of some trade offs. Increasing the diameter of rods/wires results in higher Reynolds Numbers (pushes them toward the dip in Drag Coefficient), but linearly increases drag due to increased frontal area. Increasing boat velocities results in higher Reynolds Numbers (pushes rods/wires toward the dip in Drag Coefficient) but increases drag by the square of velocity. A boat entering turbulent boundary layer conditions on the propeller guard may experience an event similar to that of going on plane. Currently when boats take off at full throttle, they rapidly accelerate, the rate of acceleration begins to slow until they go on plane. Now with less surface in the water they they begin to accelerate more rapidly. The rate of acceleration rate slows down as the boat goes faster. Once the boundary layer of the rods/wires of the propeller guard become turbulent, drag will drastically decrease and the boat will once again begin to accelerate at a faster rate (just like it did when it went on plane). This new acceleration rate will then slow down as drag continues to increase proportional to the square of the velocity. Eventually the boat levels out at its top speed. Please note, a cage type propeller guard may contribute to slowing down a boat in more ways than the pressure drag contributions calculated above. Among them are skin drag, disrupting clean flow into the propeller, and the screen behind the prop catching force of water exiting the propeller. In large slow moving vessels like houseboats designers would like to maximize guard strength by using larger rods/wires while still operating at the same drag levels. This invention may allow use of larger wires to achieve similar drag levels or possibly even reduced drag levels. Smaller faster moving boats want minimal sized rods/wires to reduce drag at higher speeds. This invention may allow use of smaller wires at higher speeds and similar or reduced drag levels. Or in both cases, it may allow the tradeoffs described (making the mesh tighter, going faster, changing wire/rod diameter, etc.) to achieve the results desired. Achieving the results desired with require using the tools and methods described in this invention. Not all wires/rods or other shapes used in construction of a cage type propeller guard mesh or screen not need to be the same size to achieve turbulent boundary layer conditions. For example, those in high exit velocity areas of the propeller may be able to be smaller. Not only may they not need to be the same size to achieve turbulent boundary layer conditions, a given wire may not be the same size or shape along its entire length to achieve turbulent boundary layer flow due to its position. By optimizing diameters and possible cross sectional shapes along the length of a give rod it may be possible to substantially further reduce propeller guard drag. The design, construction, or manufacture propeller guards for use with a turbulent boundary layer on the wires, rods, fabric, or other materials used to create the mesh/net used to protect a propeller and/or protect people, marine life, sea grass, and any other life form from the propeller. Use of cylindrical, elliptical, and/or any other shape of rods/wires/fabrics in the construction of the above guards. Use of any method to achieve earlier (at lower speeds) turbulent boundary flow on rods, wires, fabrics, meshes, nets used in propeller guards, including roughing the surface, attaching carborundum, stamping the surface to increase surface roughness, bends in the rods/wires, use of tripping wires, forming the rods, wires, or fabrics to include a tripping surface. We also claim the use of vibration and/or increasing free stream turbulence to achieve turbulent boundary layer conditions at lower Reynolds Numbers. Any method to assure the tripping mechanism for the guards above remains useful through the life of the guard, including defeating biofouling by use of antifouling coatings. While turbulent boundary conditions are best known at Reynolds Numbers of approximately 250,000 for cylinders in crossflow, our claims include propeller guards achieving turbulent boundary layers at Reynolds Numbers as low as 25,0000 or below by use of alternative shapes, roughness, grooves, tripping surfaces, increasing free stream turbulence, and other methods. Ability to use smaller rods/wires or other shapes to achieve turbulent boundary layer conditions than would be required without methods to lower the Reynolds Number range of lower drag coefficients (to move the curve above to the left). Use of members to form the mesh of a cage type propeller guards that are not necessarily of the same size of shape (use of different size or shapes in the same propeller guard) to achieve turbulent boundary layer conditions. A cage type propeller guard using of one or more individual rods or wires in which the individual rod/wire changes diameter along its length as it spans an area of the propeller guard for the purpose of minimizing drag based on boundary layer conditions at various positions along the individual rod/wire during operation. A cage type propeller guard using of one or more individual rods or wires in which the individual rod/wire changes shape along its length as it spans an area of the propeller guard for the purpose of minimizing drag based on boundary layer conditions at various positions along the individual rod/wire during operation. A cage type propeller guard using of one or more individual rods or wires in which the individual rod/wire changes diameter and shape along its length as it spans an area of the propeller guard for the purpose of minimizing drag based on boundary layer conditions at various positions along the individual rod/wire during operation. Use of a mesh in which the material used to construct the mesh is of more than one thickness and/or of more than one cross sectional shape in the construction of a cage type propeller guard. Design charts for sizing rods, wires, fabrics, meshes, or nets to achieve turbulent boundary layer flow on the above guards. Improved boat handling by use of smaller rods/wires in construction of propeller guards. Use of smaller wires/rods is made possible by lowering the Reynolds Number necessary to achieve turbulent boundary flow by the methods listed earlier. Smaller surfaces in the water improves control and reduces potential for cavitation of the propeller and other surfaces. Propeller guards with increased strength and durability brought about by the use of larger diameters materials AND/OR finer screen meshes at the same drag levels through the use of turbulent boundary layer conditions to reduce the drag coefficient of surfaces composing the propeller guard AND/OR its attachment structure. Any of the propeller guards above in which the the mesh is made from high strength fibers, such as Dyneema. The design, construction, or manufacture propeller guards for use with a turbulent boundary layer on any surface of any materials in the guard. Use of the propeller guards above in laminar OR turbulent boundary layer conditions. Design, manufacture, and/or use of the propeller guards above in fresh or salt water. Ring/Duct type propeller guards using the principles above. Combinations of ring/duct/cage type guards using the principles above. Those applying the techniques above will need to test various sizes and configurations of rods/wires to achieve the desired results in their operating conditions. Test data exists for wires, rods, screens, meshes in flow tunnels, however that data does not typically include the effects of operating near a propeller (or near a drive or the bottom of a boat). We have also seen several studies of fish cages (screens in crossflow). In addition, we have seen some data where screens were used to induce free stream turbulence in front of propellers for model testing. Plus other data is available for screens on large intakes (water inlet fish screens at the power station, etc). Model testing involves many scale effects when propellers are brought into account and appear to be of limited use in designing full scale propeller guards with screens or meshes using the principles above. It looks like we are back to the three runs upwind and three runs downwind and averaging the performance data of the boat to compare different configurations. A guard could be constructed with a quick change rear screen (bolts on, clamps on, etc). This would allow quick changing of rear screens during testing. Initial tests could focus purely on the rear screen and potential reductions in rear screen drag using the techniques above. If the drive manufacturers, boat builders, and those manufacturing propeller guards are interested in pursuing this idea it might be more easily done together in a manner where everybody did not have to reinvent the wheel. A grid of tests covering the most promising applications could be ran and design tools published allowing quicker deployment of this invention. Those tests could be done by an industry consortium (such as the Boating Industry Consortium to Address Propeller Injuries we proposed back in December 2002), by NMMA, ABYC, the Coast Guard, or by a combination of these groups. A parallel path might be CFD modeling (Computational Fluid Dynamics). If you are interested in this route, please contact us as we know a firm working in this area. We will be posting our future modifications or thoughts about this invention here. 24 March 2011 post – Flow is obviously very turbulent immediately behind the propeller when it is propelling the boat forward, even at slow speeds. Drag on the rear screen of a conventional cage type guard can be greatly reduced by “swinging” the rear screen as shown in our Flapper Propeller Guard invention disclosure. We welcome any comments you may have on our disclosure a method of reducing propeller guard drag.